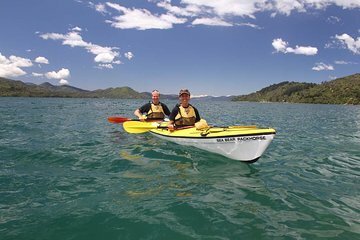 Tour den västra änden av Queen Charlotte Sound på en halvdags paddling äventyr från Picton. Lägg dig in i havskayan och följ en expertguide från vattnet till skyddade vikar och avlägsna stränder. Sök vattnet för örnar strålar, skarvar, små blå pingviner, Nya Zeeland päls sälar och delfiner medan du lär dig om Marlborough Sounds naturhistoria. Nummer är begränsade för att säkerställa en gruppgruppserfarenhet. We were on a cruise that included a day in Picton. My wife and I had never been kayaking before and decided to give it a go. What a great decision. First of all the cruise schedule changed due to weather and sea condition, but Wilderness Guides were brilliant at rearranging our booking around this moving both the date and the time to accommodate us - thank you Courtney. The office was very easy to find and the staff were friendly. Merlin was our guide and it was quite a magical experience. He explained clearly what we would be doing and when we got to the site he made sure we were all aware of the safety processes. Our group was just 7 people and Merlin so was very easy to keep together and listen to what was being said. We were in the kayaks for probably 3 hours I really can't be exact! but it went so quickly and was very easy to keep up with the other people despite being kayak virgins! The scenery was breathtaking and would love to visit the place again. Saw some jellyfish and stingrays along with a number of birds, Merlin was very knowledgeable despite not being a local! A amazing experience and our guides were excellent! This is a very age friendly Kayak as it is not too strenuous! Absolutely loved it! What a fantastic kayaking trip! 8km of the most incredible views right from the waters edge! The two tour guides we had were so informative, personable and enthusiastic. It was only the second time we had ever kayaked and they made us feel very comfortable and that we were doing a great job! We arrived by cruise ship and couldnt find any tours in Picton that would work with the ships arrival and departure times. This one worked and we were so glad that we did it. Definitely recommend this tour for anyone going to Picton. The kayak trip was one of our highlights. The kayak guide, Merlin, was wonderful!. I would highly recommend this excursion. Amazing! We were late arriving at the tour due to our cruise ship arriving late, but our tour guide was all set up and patiently waiting for us to arrive! He shared great information about the wildlife and New Zealand! I don't think there was a question we asked that he didn't have the answer to! The entire family agreed that this was the best tour we went on during our trip to New Zealand! The best!!! Martin, Courtney and Jason from wilderness guides are fantastic!!! Absolutely amazing morning kayaking. The bloke taking us out on the water was incredibly personable and friendly, he knew a lot of stories about the area and what animals to look out for. One of the best things we did in Picton and the Marleborough area. Would highly highly recommend this! This was an amazing half day tour around Marlborough Sounds. Our guide, Merlin, was fantastic--very patient, accommodating, and knowledgeable about the area. We saw, several seals, starfish, jellyfish, several stingrays, and a beautiful bird native to the area. The weather was perfect with blue skies and no clouds. I would highly recommend this relaxing tour if you are looking to experience the beauty of the Sounds! We had a beautiful, amazing half day on the water. It's a very special place. Our tour guide was friendly, informative and professional. Our group was small 7 people and the weather perfect. Thanks so much for one of the best days of our trip to New Zealand and Australia. This was an experience to remember. Amazing sites in the Queen Charlotte Sound. Was able to kayak past the amazing scenery and wildlife including stingrays, eagle rays, a seal as well as native birdlife. The kayaking was easy going in the calm waters. Even got to kayak past the cruise ship. The Tour guide was very informative and gave us a good understanding of the sites we passed as well as about the local area. Well worth doing and would happily do tour again with this tour company.